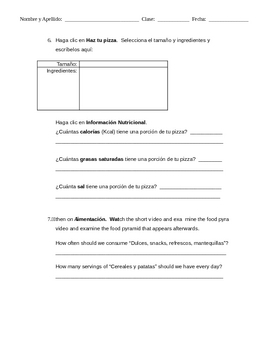 This worksheet guides students in examining the web site of a popular pizza restaurant chain in Spain. Among other things, students identify ingredients and restaurant locations. Students design their own pizza and analyze the nutritional content of their custom pizza. Questions are mostly in Spanish, with a few phrases in English. Great for a homework assignment, extra credit, or activity in a computer lab. Answer key included.